← Wordstock Weekend: Go Here Now. Finding the Forest. Image: Julia Keefe and John Klicker. In 2008, I sat down with dance artist Linda K. Johnson in her shady Portland bungalow. Johnson moved around her kitchen with a loose gait, dressed in a hoodie and yoga pants, to make us tea. 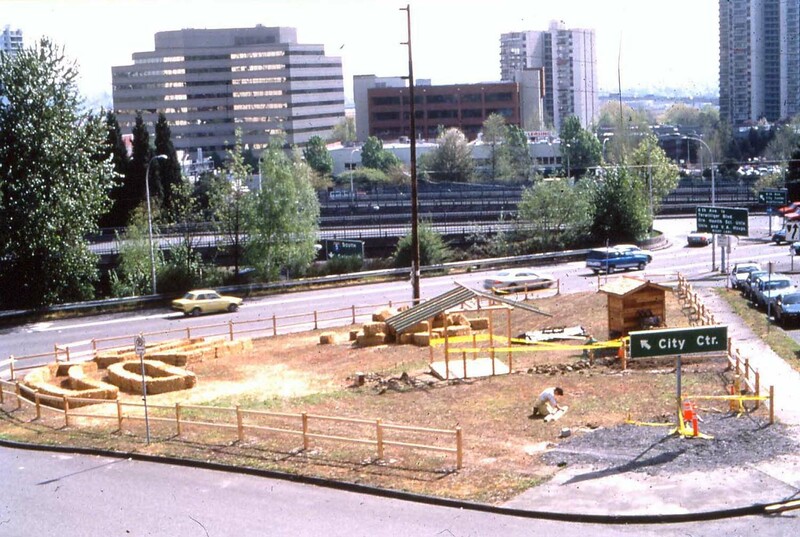 In the ‘90s, Johnson was intimately involved in the early beginnings of the Portland Institute for Contemporary Art (PICA). 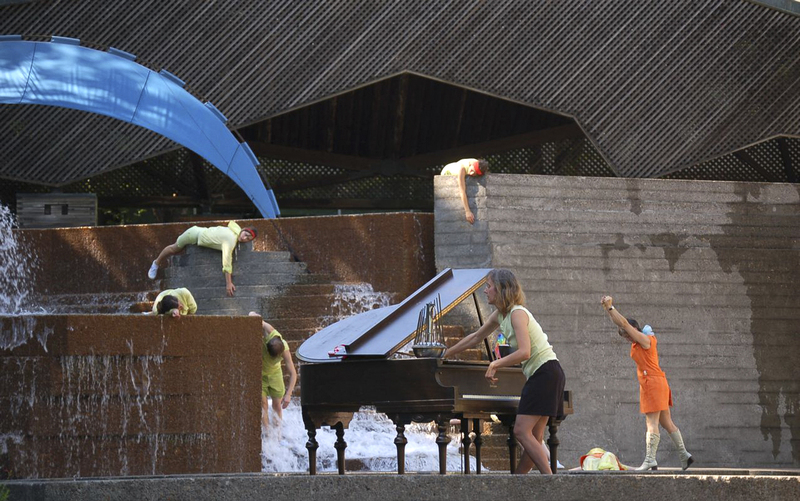 PICA’s Time Based Art festival, an international performance festival, had in the fall of 2008 just presented collaborators Johnson, Randy Gragg and Third Angle Music’s City Dance, an installation of over 30 dancers in the four downtown fountains designed by architect Lawrence Halprin. 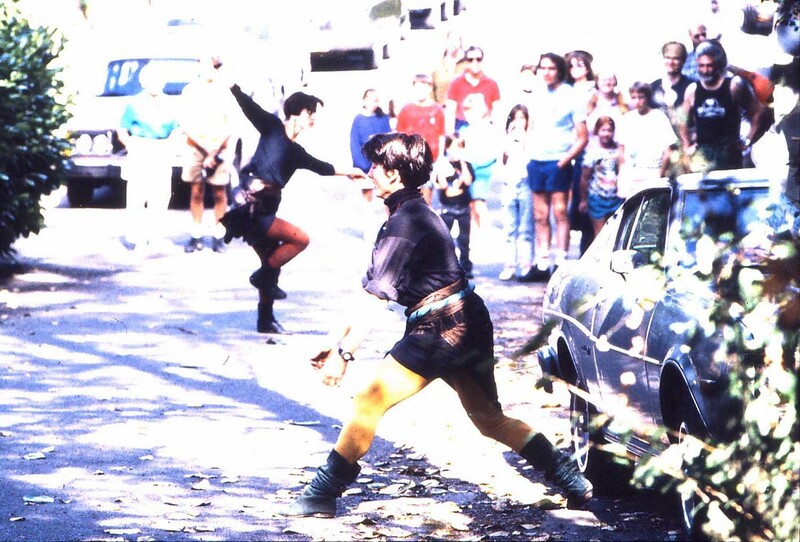 City Dance celebrated how Halprin drew on the participatory performance work of his wife, the modern dancer Anna Halprin, to avoid the gutting of the urban center typical of ‘60s urban reform and instead invited participation by passersby going about their daily lives. 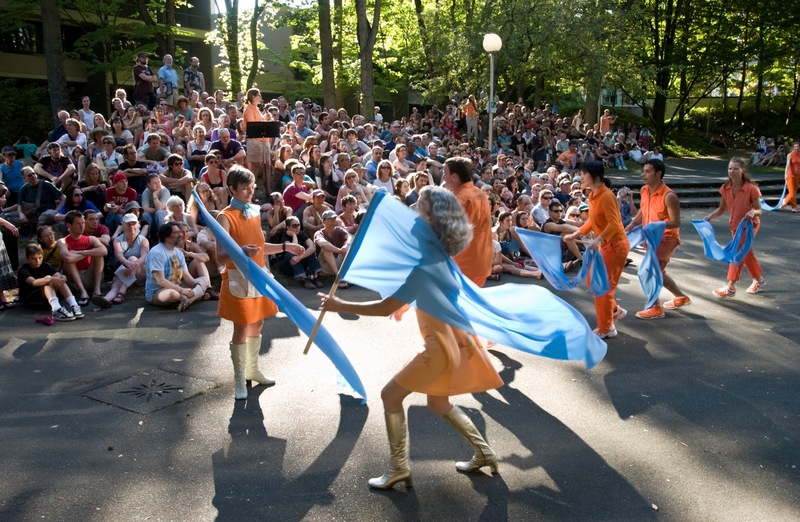 Lawrence Halprin’s innovation became part of the common vocabulary of public space today. Johnson’s work shares many of these concerns with how we use our spaces. Learn more about the fertility of Portland’s creative space and our new national relevance after the jump. City Dance. Image: Julia Keefe and John Klicker. Nora Robertson: Portland is getting a lot of national attention lately compared to fifteen years ago. What do you think is going on? Linda K. Johnson: I think there has been this slow bubbling up of the audience. People would say that we were moments away from a renaissance. The creative community was starting to happen. People started moving here. It was years and years and years of regional planning. All those things started to create the perfect storm for a certain kind of culture that we have now. We are still the city on the West Coast that does whatever it wants. We live in this state that has the bottle bill, the death with dignity act, and the urban growth boundary. The artists are just another group of people in this climate of complete authenticity. NR: The writer [and Plazm editor] Jon Raymond said that Oregon historically is a place where people moved to get away from history. What history do you think people are moving here to get away from? LKJ: People came here to get away from history, but they knew the history. The West Coast and Oregon are places that traditionally people have gone to start over and have the freedom to do what they want to do. I think people view it as a place where they can come and adopt any posture, that there is space for new ideas to live here. They are going towards an open space. Part of why it was possible was that the infrastructure isn’t so clamped down. I could make a piece in Forest Park that went on for eight hours, and people weren’t sure if it was an installation or nature. I saw there was space for me to make things that existed in the cracks. I got rewarded for that in that they got funding, they got written about, they created dialogue with my peers, and they created new opportunity. It is not just that people came here, but that people could stay here too because there is a fertility here that makes things possible. NR: Would you say that a concern with the spaces we live in is typical of your artistic concerns? 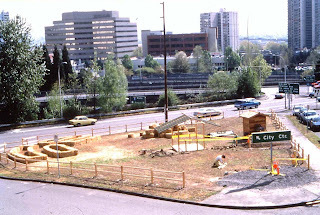 For example, your installation, Tax Lot 1S1E4ODD, made a temporary garden out of a vacant lot by a freeway. LKJ: What I was trying to get at there was to make us look more carefully at density and urban planning. 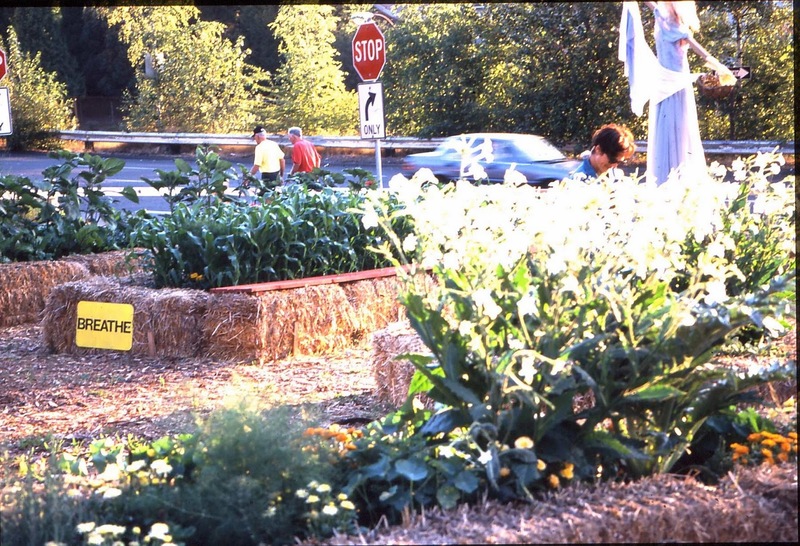 That garden was really about asking everyone to consider more deeply how we use this land out there. For me, it was a performance piece. 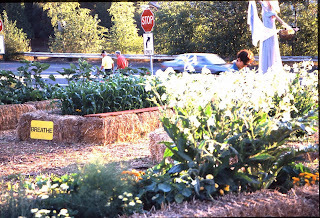 The gardeners and the plants were performers and the buses, cars, automobiles, and walkers were the audience. I think the thing that has always been very important in my work is that it is not done until there is a blurred line between performer and participants. How do you get people to re-map and change their three-dimensional sense of where they go and the potentiality of what that new space means? People began to have a poetic sense of that space. 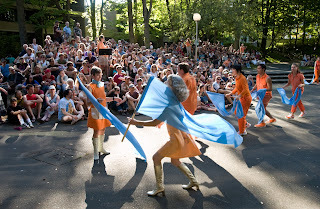 NR: One thing I found fascinating in City Dance was how the hardscape you were celebrating was in itself a marriage between architecture and dance in some ways. LKJ: [Lawrence Halprin] felt like public spaces should be stages for theatre. They should be stages for participation. When you think of public plazas before Halprin and the early sixties, you came and sat on a bench. Those fountains were revolutionary. They really invited you to move into them and participate with them. Now we take it for granted because he changed the way we used public space. I still think possibility is still really highly prized here, possibility and authenticity of thinking. NR: What do you think about the issue of ambition? When is it making a living, and when is it selling out? LKJ: I think it is more subtle than that. For someone living in a household with two independent artists, I think it is reasonable for us to think we can own a modest home and make a living with what we do. I think that is separate from a certain pomposity about fame or fortune. I think those things can be separate, but unfortunately, they can get confused. I think every artist needs to have a little more fear in there. I think things need to get really gritty again for a while in counterbalance to being really sophisticated. Whatever gets made here needs to be really honest. 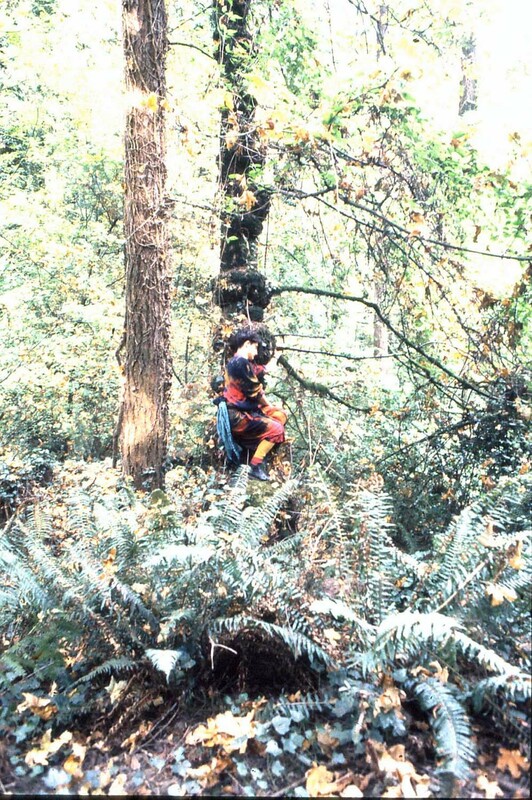 NR: That makes me think about Anna Halprin because she was someone working on the West coast who was ignored, and this gave her the freedom to push boundaries. LKJ: She did outrageous stuff. She has been kicked off the dance tree three times, the history dance tree. Once because she moved out to the West coast out of the limelight. The second time was because she took off her tights and leotard and left those behind. And the third time was because she really started dealing heavily with emotion and one’s personal life. People thought she was not making art anymore. Her path has been painful for her. Now she is, in her nineties, finally fully re-embraced for what she has done. She would be an absolutely different maker if she had stayed in Manhattan. NR: Sounds like a lot of the influence of Portland was that it wasn’t nationally relevant. LKJ: That is the truth of things. One of the mothers of modern dance here, a dance mentor for me, was getting National Endowment for the Arts funding in the seventies and no one was getting that sort of national attention in dance. She told me the hardest thing about Portland is no tree can ever grow taller than another tree. We are so supportive of each other to a certain point, but that keeps everyone at this interesting level. There was a very subtle withdrawal of support or tension that kept people from moving out in a way. She was very poised to work on the national level. She was brilliant, a very unusual maker, a Fellini of dance. That was her feeling about staying here, and other people have moved away for periods of time in order to move themselves into a different conversation, to make connections and relationships to see where they could actually take their work. Other people have left. Certainly places like PICA have pushed open some of those conversations. I do think there is a slow and steady potential for some of that weight to lift. 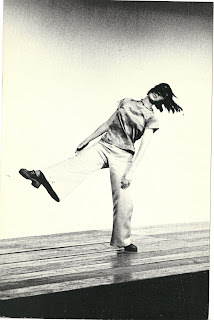 Yvonne Rainer performing Trio A in 1970 at the Portland Center for the Visual Arts. Courtesy Linda K. Johnson. 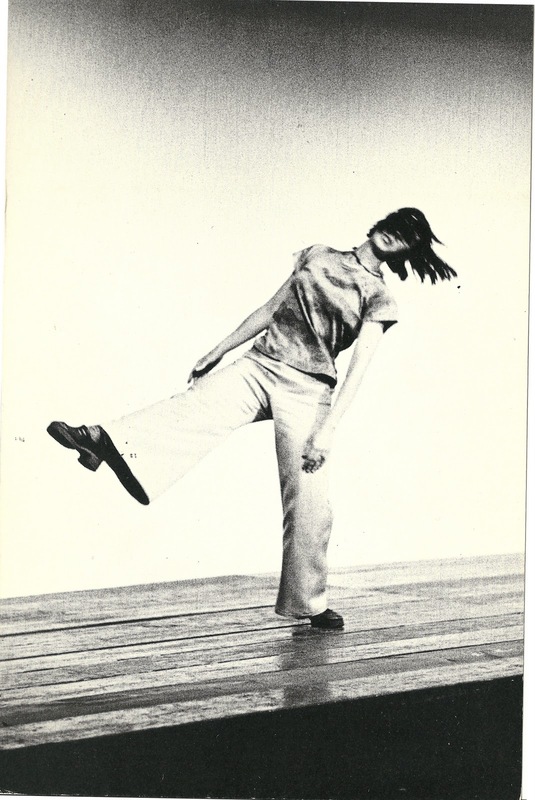 NR: One thing I wanted to ask you about was Yvonne Rainer’s seminal post-modern work Trio A. How did you become a custodian of that piece? LKJ: I used to go to New York three or four times a year to look at art. I remember it was pouring rain. I got out of the cab and ripped my backpack. I went in and in the far corner, there was a little movie playing on the wall with three pillows around it, and it was Trio A. I sat down and must have watched it for three hours. I thought, “I don’t even know how to move like that. I don’t even understand that. Is that dance?” It really went into me. A couple of years later, I got an Oregon Artist Fellowship from the state, so I used my fellowship to go to New York to learn Trio A from her. It opened huge doors for me. I ended up meeting Shelley Senter, and we wrote Yvonne and said we wanted to have the rights to teach it so we can keep it alive. Now Shelley and I are two of three official custodians of this work. Yvonne, this is the dance of hers that will live on because it is really considered the citadel of postmodern work. All these people ended up finding one another in 1961 at Judson Church and becoming this melting pot of rebellion. 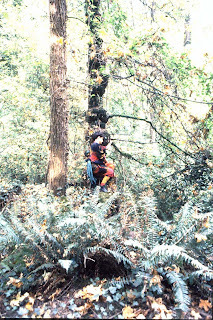 Anna [Halprin] is in there. Her embrace of improvisation, embrace of the walls, evaporation of the traditional stance. She is so influential on all these artists. There is such rigor there. That is the thing about Portland. Rigor looks a little different here. It is in the nature of how the region thinks about itself. I think there is huge potential for the rest of this country to see us as this very fertile creative environment. This entry was posted in Art, dance, interview, Linda K. Johnson, New Oregon Interview Series, PICA, Randy Gragg, TBA. Bookmark the permalink.